BBC SPORT | Cricket | Counties | Nottinghamshire | Will Swann sink or swim in new waters? 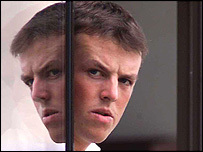 The 2005 season could make or break Graeme Swann. The off-spinning all-rounder left the comfort zone of Northamptonshire in the winter and set sail for Nottinghamshire. Player moves might be commonplace in county cricket, but for Swann the stakes are higher. 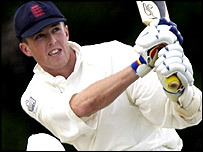 At 26, Swann knows the time has come to remind England selectors of the quality that won him a one-day cap on an ultimately unrewarding tour of South Africa in 1999/00. In switching clubs, Swann's talents will now be paraded in Division One of the Championship and often at Trent Bridge, a renowned graveyard for spinners. "I had come to the end of my time at Northants and Notts made it very clear that they wanted me," Swann tells BBC Sport. "It was just the right time to move on. Notts is a very big club and everything about the move just seemed right. "I am at the right stage of my career where I really want to push on and get back into the England team. "I see it as a challenge because Trent Bridge isn't known for being very spin-friendly and if you take wickets there you must be doing well. "Spinners don't get the credit they deserve at Northants because it is a spinning track and people think that if you have done well there it is only because of the pitch." Swann played 110 first-class matches for Northants, taking 294 wickets at an average of 31 and earning a reputation as a buccaneering middle-order batsman. He was fast-tracked into the England set-up after an impressive debut season in county cricket, but that tour of South Africa six years ago went far from swimmingly for Swann. An extroverted and fervent character, Swann, then 20, could not break into the Test team and was ill-equipped to deal with the disappointment. His plain frustration at not being picked resulted in run-ins with England management, who misunderstood his zeal and saw his confidence as arrogance. "I was young and just wanted to play cricket. So when I wasn't I found it frustrating and perhaps didn't know how to handle it," Swann recalls. "It didn't work out for me back then but it wasn't a bad experience, and it actually made me even more determined to play for England again. 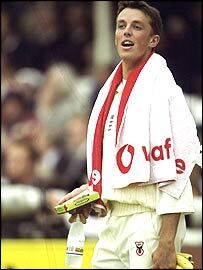 "But more than anything else I am a better cricketer now than I was then. "I like to believe that if I do the right things and take a lot of wickets, then my time will come." Swann has impressed the people that matter at the England Academy and performed well on the recent England A tour of Sri Lanka and the UAE. "I feel I played well with England A and want to have a long and successful career with the first team. "But that has been my aim at the start of every summer, not just this one." Besides furthering his England claims, Swann is determined to do a job for Notts, who last year won Championship promotion as runaway winners of Division Two. He shares a belief at Trent Bridge that they can push for top honours despite being a promoted outfit. "I wouldn't be interested in playing for a team which just wanted to eke out an existence," Swann says. "Notts had a fantastic year in 2004 and everyone here at the club feels 2005 can be just as good, if not better. "Look at the squad of players and it is very impressive. I have been very impressed with the coaching set-up and everything at Trent Bridge. "They are a very hard team to beat. They are capable of making very big scores in the first innings and then making it hard for the opposition to get back in the game." The past few years of Swann's career has been all about getting back in the game, and 2005 could be the year he finally gets there.